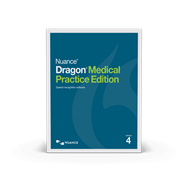 Dragon Medical Practice Edition 4.4 - download only. Dragon Professional Individual and Group 15 are excellent speech recognition products for "general purpose” home or business use. Built expressly for use by healthcare providers, Dragon Medical Practice Edition combines 90 medical specialty and sub-specialty vocabularies with acoustic models based on the unique way physicians speak audio, syntax, style, and structure giving clinicians a far superior dictation experience. Dragon Medical Practice Edition achieves 99% accuracy out-of-the-box without voice profile training. Clinicians not only save the time and hassle of correcting errors or adding medical terms, but also benefit from a sophisticated context database biased to clinician behavior that compounds the value of the comprehensive medical vocabulary. Further, Dragon Medical Practice Edition provides greater levels of information security essential for the healthcare environment. Secure encryption methods throughout the workflow support HIPAA requirements for patient security and confidentiality. What EHRs work well with What Dragon Medical Practice Edition? Nuance collaborates with more than 150 EHR and healthcare technology leaders to make it easier for clinicians to document. The Dragon dictation box allows clinicians to compose content insert auto-texts, navigate template fields, dictate, and edit and transfer text into textbox fields of all major EHR systems with a simple voice command. Each Dragon Medical Practice Edition user must have a unique license and be the sole user. A licensed user may install Dragon Medical Practice Edition on no more than four individual devices. Do clinicians still need to use a keyboard and mouse? Clinicians can use Dragon Medical Practice Edition to automate their documentation workflow with voice. Clinicians can save countless clicks and keystrokes with powerful speech commands for navigation and other tasks, as well as auto-texts that quickly generate common content. 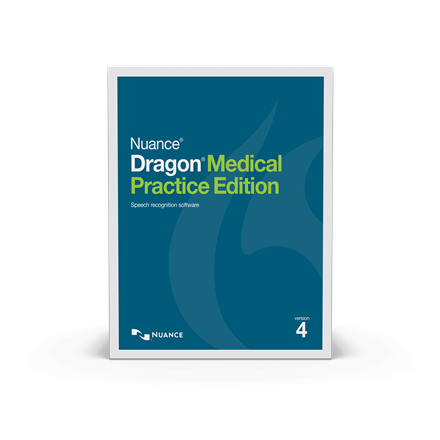 Dragon Medical Practice Edition contains vocabularies covering more than 90 medical specialties and subspecialties. Choose "General Medicine” or the closest appropriate specialty vocabulary if a specific specialty is not listed. ROM drive required for installation. Flash drives can be procured for a nominal charge. Some resellers offer a downloadable version. Documentation varies from patient to patient, physician to physician, EHR to EHR, by type, length and content requirements but the pressure to create timely, accurate and compliant clinical documentation in the EHR never wavers. Clinicians need to be able to quickly and easily capture the complete patient story. Nuance Dragon Medical solutions accurately translate the doctor’s voice into a rich, detailed clinical narrative that feeds directly into the EHR. Improve documentation, boost efficiency, increase physician satisfaction, and eliminate transcription costs. No matter how you work, there’s a Dragon Medical solution that works for you all with fast, accurate, responsive clinical speech recognition and end-to-end security. In addition to powering the speech recognition engine with vocabularies and acoustic models biased towards healthcare vernacular, Nuance has optimized Dragon Medical for specific workflow and user needs, giving healthcare organizations the ability to choose the solution(s) that best fit clinical workflows, IT infrastructure requirements, and business goals. Dragon Medical embedded in EHR: Cloud-based clinical speech recognition delivers an intelligent voice-driven user experience directly in your mobile, web-based, or desktop EHR all with no software to install. Dragon Medical Practice Edition: Locally installed clinical speech recognition solution designed and priced especially for independent practices of 24 physicians or less. Cutting edge speech technology delivers superior performance. Powered by the latest in speech recognition technology, Nuance Dragon Medical Practice Edition 4 achieves 99% accuracy out of the box without voice profile training significantly outperforming previous versions. Distinct from non-medical speech recognition, Dragon Medical Practice Edition combines 90 medical specialty and subspecialty vocabularies with acoustic models based on the unique way physicians speak audio, syntax, style, and structure resulting in remarkable accuracy. Advanced Deep Learning technology continuously learns and adapts to voice and environmental variations even during dictation endlessly refining performance. Upgrade existing voice profile settings and begin using the new and improved locally-installed speech engine in as little as 60 seconds. Options and settings are consolidated into one easy-to-use dialog box or easier management of profile and auto-formatting options. Along with generating narrative content within applications and HER textbox fields, clinicians can use voice to interact with websites and select web-based applications.